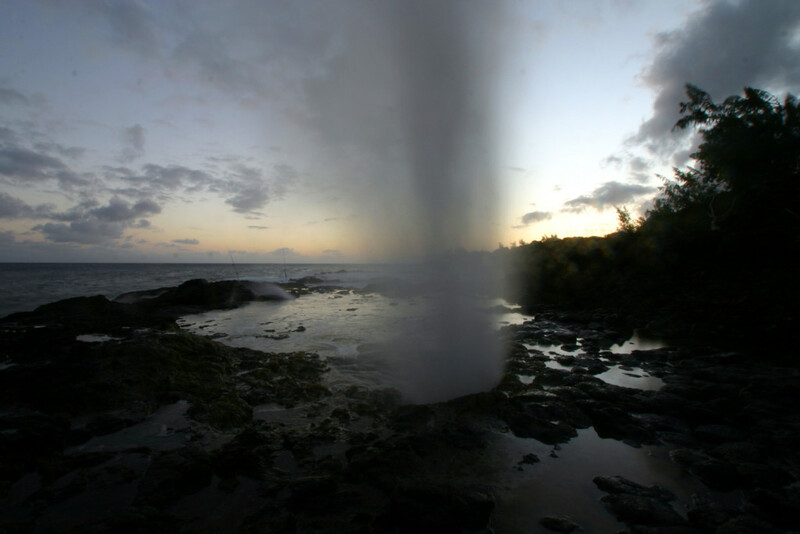 Spouting Horn Park was called puhi, or blowhole, by early Hawaiians. It was formed when waves eroded softer, underlying rock and wore through the harder top rock. Water rushing into the hole is forced through the narrow opening and shoots skyward, sometimes reaching heights of over sixty feet. There is a larger blowhole just a few feet east of Spouting Horn called Holona. Old‐timers tell of huge geysers that shot water so high (200 ft) in the air that when south winds blew, the sea water from the geysers would blow onto and kill the sugar cane in the adjacent fields. The plantation dynamited this blowhole in the 1920s. Legend states that this coast was guarded by a large moʻo (lizard) who ate everyone who tried to fish or swim here. One day, a man named Liko entered the water. When the moʻo went to attack him, he swam under the lava shelf and escaped through the hole. The moʻo became stuck and was never able to get out. The groaning is the cry of hunger and pain from the lizard still trapped under the rocks. Popular visitor attractions are Spouting Horn and the Spouting Horn vendors, offering residents and visitors a unique shopping experience in the covered stalls. You will find great prices on beautiful jewelry and gifts.